A latte art throwdown is a fierce competition where baristas compete head-to-head, pouring designs with milk into cups of espresso in front of a panel of judges. Tensions are high, coffee is hot, and everyone is vying for a shot – quite literally – at the title. Most importantly, throwdowns provide members of the coffee community with an opportunity to gather, socialize, and celebrate their favorite beverage. The Espresso: Winning a latte art throwdown hinges on having an exceptional espresso base, says Orinoco’s resident expert John Cheng. First and foremost, you want to avoid a super runny consistency. Espresso blends, in particular, are top-notch, as their design fosters a beautiful crema, a full body, and just the right consistency. A caramel color, with a bit of browning, adds impressive contrast. The Cup: Perhaps one of the most central elements in creating latte art is the cup used. 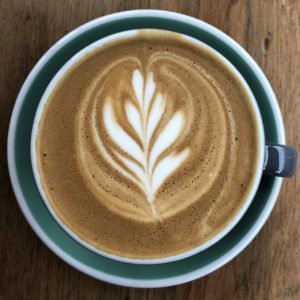 While latte art technically can be poured into anything – John’s seen them poured alternately into an ice cream scoop and a person’s mouth – a curved, bowl-shaped cup with a rounded bottom and no interior ridges is the go-to for serious contenders. Cappuccino cups are ideal. Ridges, indents, weird protrusions, and crafted designs can considerably alter how your milk works within the espresso. A rounded bottom helps to push milk up to create your art. The Pitcher: Choose a quality pitcher with a decent, pointed spout. The point is critical, as it helps to channel your milk into a direct stream. The Temperature: Typically, a temperature between 130-140 degrees is ideal to ensure your milk will not be overcooked or aerated. This range will also yield a coveted “wet paint” consistency. If the temperature is cranked up too high, your milk may get scalded, while over-aeration pulls apart proteins and prevents you from creating your design. The Technique: Take care when steaming the actual milk, says John. Almost every espresso machine features a steam wand with four holes that shoot out air to create foam on the milk. Baristas will want to insert the steam wand into the pitcher no more than a quarter of an inch to suction just the top of the milk. Tilt your pitcher at a 30-degree angle to create a small vortex. When you start hearing a loud hissing sound, wait just a moment before removing the wand. If at any time you hear a continuous hissing, you’ve gone too far and overaerated your milk. Results will be chunky or non-existent. The Milk: Whole milk is the key – and the fresher, the better. Believe it or not, the diet of the dairy cows is even a factor. Depending on the season, local farmers often change the diet of their cows, which subsequently changes the quality of their milk. Do your research beforehand, or make friends with the local farmers, if at all possible. Local events are often hosted just for fun by mom ‘n’ pop cafes and coffee shops. Regional competitions can get more intense, with baristas bringing their own tools and pitchers. Winning a latte art showdown is all about adapting to the environment, says John. With these six tips, you’ll be ahead of the game. Purchase a bag of Orinoco’s Espresso Blend and start practicing latte art at home today.